This research was funded by the National Institute for Transportation and Communities, or NITC, a program of TREC at Portland State University. 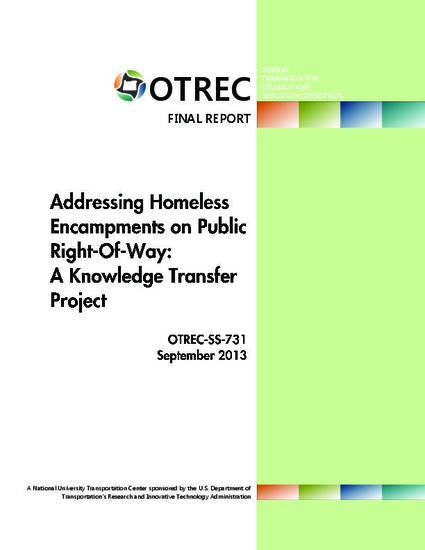 This technology transfer project provided practical information about how to address homeless encampments on public right-of-way to transportation professionals, including Federal Highway Administration officials, Oregon public works directors, transportation educators and students. Through a previous project funded by OTREC and Oregon Department of Transportation, research had been conducted about the extent of the issue among state transportation agencies and how they were addressing it. The prior grant also provided for the development of a Best Practices Guide. The current project enabled staff to present the results of the research to transportation practitioners and policy analysts through multiple forums and media coverage.